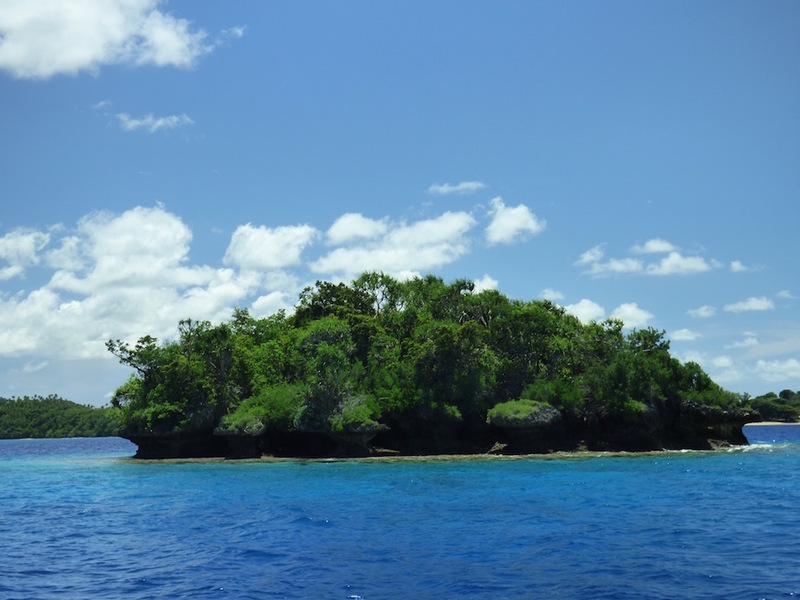 Lape Island toward Vaka ‘Eitu near Coral Gardens in Tonga’s Vava’u group of islands. Note the “shallow spot” in blue indicated with my red arrow. 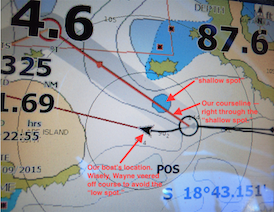 Navionics fixed this - update your software to correct your chart plotter. We’re firm believers in avoiding shallow, rocky, reefy areas in the dark, even though we use a good GPS/plotter chart system. That’s because ultimately, we trust our eyes above all our instruments if there’s an apparent concern. Our chart system indicates water with white, shallow areas with blue, land with yellow. Shallow areas can be quite deep, just noticeable shallower enough to potentially cause an issue for a vessel, or it can drop to as shallow as a few feet ( a meter or less). With a draft of only 4 ½ feet, often avoiding shallows is more of a precaution that a danger. Still, we avoid indicated shallow areas as a matter of course. 99.99% of the time, our Lowrance/Navionics navigation system is spot on, except of course that vital .01% of the time (or less) when it’s wrong. Of course we notice it when it’s most shockingly, blatantly wrong. Sailing Tonga’s Vava’u group of islands, we were threading our way between islands from Hunga to Vaka ‘Eitu, near Coral Gardens. Our showed a shallow area directly in our path. If we were feeling gutsy, and weren’t watching, we could figure on sailing right over the spot, without deviating our course. Good thing we don’t! And that we sail in good light, not relying on our chart plotter to “see” for us, except in open ocean on log passages, when we have no other option. This is where the “shallow spot” is – an island! Where the “shallow spot” was is a small island! It rose a good 30 or so feet up. Hardly something that sprouted up so recently it didn’t exist when our chart was created. That would’ve really hurt if we didn’t see it! Navigation systems are great, but nothing beats human observation when sailing in good conditions, the kind of conditions we strive to sail in whenever the navigation’s potentially tricky. This post was written and pre-posted and pre-posted in Uoleva, Ha'apai TONGA (S19.50.863 W174.24.864), about our trip into Vaka 'Eitu Tonga (S18.39.443 W173.58.965) near Coral Gardens. When it posts we will be underway to New Zealand, with a possible stopover in Minerva Reef (S23 37 W178 57). We expect to arrive in Opua New Zealand (S35.19 E174.07) in mid-November.